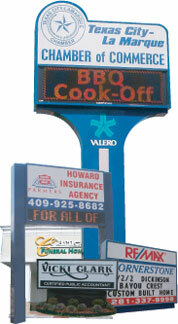 Your one-stop shop for signs and advertising. We have proudly served Texas City and the surrounding communities with a staff that has 50+ years experience in the sign and graphics industry. Our work is second to none. We pride ourselves on professional, fast, friendly service. Looking for a Texas State Licensed Sign Contractor? A well designed sign is the first impression your customer usually gets of your business. Make a big impression with TNT Signs & Graphics. We custom design, fabricate, and install electric signs. Vehicle Graphics ...We've got you covered! Magnetic signs, custom lettering, to full body automobile wraps we can do them all! Please take a moment to view a few of the many graphic design services we offer. Feel free to call us to discuss your graphic design and signage needs or complete our on-line quotation request and one of our representatives will call you.